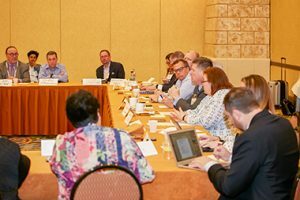 FSI’s Supervision Workshop will shed light on the recent state and federal enforcement efforts addressing cybersecurity, vendor management, Regulation S-P, expense sharing agreements, outside business activities/private securities transactions and more. These enforcement actions have unique impact on independent broker-dealers (IBDs). Participants will leave with a deeper understanding of IBD risk areas; the rules and regulations governing those areas; the interplay between those rules/regulations and the IBD business model; and best practices utilized by their peers. This event is open to FSI firm members. Space is limited, so register today! If you do not remember your password, you can send yourself a link to reset. Should you need to cancel, we kindly ask you to contact events@financialservices.org no later than April 30, 2019 to receive a full refund less a $75 processing fee. After April 30, 2019, no refunds will be issued. During this session we will discuss enforcement activity at both the state and federal levels and their unique impact on IBD supervision. Delve into the complexities and potential risks associated with advisor compensation arrangements. This session will also include an overview of FSI’s payment to ensemble practices efforts and where they stand today. This session will explore firms strike the right balance between satisfying regulatory supervisory obligations, the IBD model’s entrepreneurial focus and your advisors’ independent contractor status. Speakers will highlight key supervisory distinctions between independent contractors and employees followed by a detailed overview of significant state independent contractor cases and trends. Industry experts are predicting that regulators will move away from issuing additional guidance and move toward increased cybersecurity-related enforcement actions. During this session, we will explore key cybersecurity issues such as managing Regulation S-P issues when an advisor transitions to a new broker-dealer, managing vendor relationships at the branch office level, advisor CRMs and more. Should advisor-owned business entities be disclosed as an outside business activity (OBA)? What impact, if any, would FINRA’s proposed OBA rule have on those disclosure obligations? This session will explore these questions as well as discuss current OBA and PST rules and what FINRA Regulatory Notice 18-08 means for firms’ reporting and disclosure requirements. Learn more about the rules, regulations and guidance governing expense sharing agreements. We’ll also discuss when an expense sharing agreement is required between a firm and an advisor-owned business entity. Crystal City in Arlington, VA provides some more economical hotel options and is located near Reagan National Airport (DCA) – approx. 4.0 miles from FSI’s office (about $20 cab fare, one way). Additional transportation options include Amtrak and Metro. FSI’s office is located conveniently in downtown D.C. near the White House, National Mall, Smithsonian museums and Capitol Hill. 100 Free and Almost Free Things to Do in D.C.